The San Antonio Spurs lose in final seconds to the Memphis Grizzlies, 104-103 on Wednesday night, November 21-2018, at the AT&T Center. The Spurs (33-26) snapped a four-game skid with the win. What a wild finish. Both teams had chances to win, but the Spurs' execution was just a little bit better. The Grizzlies cut the lead to 107-106 with a minute left, but LaMarcus Aldridge doubled the lead by making one of two free throws after a hard foul. Down by two, Grizzlies rookie Jaren Jackson Jr. drove to the rim, drawing a foul with one second left. He missed the first but made the second, so the Spurs inbounded the ball and ran out the clock. The Spurs had lost the first four games of the Rodeo road tip, so this win sets up the All-Star break to not be a miserable one in San Antonio. The Spurs don't play again until Friday, February 22. Patty Mills and LaMarcus Aldridge each scored 22 points to lead the Spurs, who made 62 percent (13-21) of their three-pointers as a team. Davis Bertans (17), Rudy Gay (15), DeMar DeRozan (12) and Marco Belinelli (11) were the Spurs other double-digit scorers. Gay also had a near triple-double, with 12 rebounds and 8 assists. Memphis was led by players it acquired at the trade deadline. Avery Bradley scored 33 points and Jonas Valanciunas tallied 23 points and 10 rebounds. This was the fourth and final meeting between Memphis and San Antonio this season. The Spurs finish with a 2-2 record against the Grizzlies, who will probably miss the playoffs again in 2019. It's shaping up to be a good finish. The Spurs have the star power in this matchup, but some stretches of cold shooting have kept the Silver & Black from pulling away. With 4 minutes left, it was just a 1-point lead for San Antonio. As the quarter begins, Patty Mills has already reached a season-high 22 points and the Spurs are an astonishing 13-of-16 from three-point range. After three, the Spurs lead 94-86. Balance is the name of the game for the Spurs as the third quarter approaches its conclusion. Five players have 10 or more points with 2 minutes left in the third, and none has more than Patty Mills's 16. Meanwhile, Memphis has two double-digit scorers. Avery Bradley has 27 and Jonas Valanciunas has 14. That second-quarter momentum has carried right over into the third. Plus, Memphis has apparently forgotten how to score. After 5 minutes of play in the third, the Grizzlies have scored three points, allowing the Spurs to take a 69-61 lead. Davis Bertans keeps doing his thing, and while LaMarcus Aldridge might not have his A game tonight, he's a competitor. At halftime, the Spurs trail 58-57. The Spurs are getting good performances from almost everyone, save for their best players. DeMar DeRozan and LaMarcus Aldridge are a combined 3-of-14 shooting the ball, with 5 points each. Patty Mills leads the team with 13 points, while Rudy Gay and Davis Bertans have chipped in 11 each. The Grizzlies' Avery Bradley leads all scorers with 19 points. He's the only Memphis player to reach double-digit scoring. The Spurs attempted 8 free throws in the game's first 8 minutes, but tried just 5 more free throws in the next 16 minutes. San Antonio is letting it fly from deep with great success, draining 8 of 11 triples. That dwarfs their overall field goal percentage of 43 percent. The Spurs bench, usually a strong point, has been a liability. Jakob Poeltl, for example, played 6 minutes and the Silver & Black were outscored by 14 points in that time. After the Grizzlies took a 42-33 lead with 9 minutes to play in the half, the Spurs went on a tear. A 14-4 run never hurts, and the fact that the Spurs did it in 5 minutes of clock time is fantastic. Marco Belinelli played a huge role. 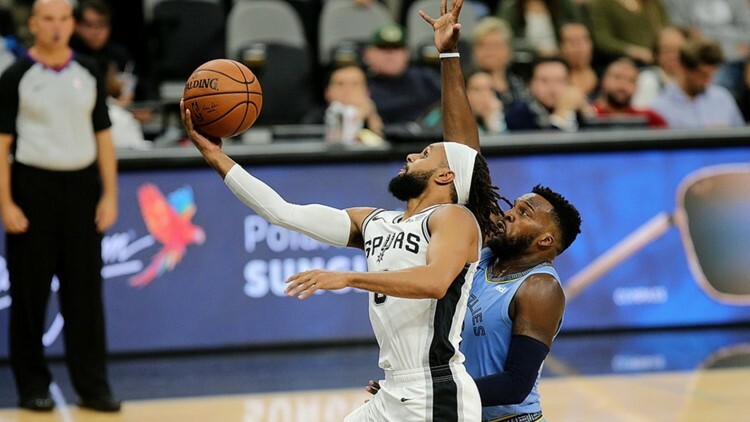 After exchanging baskets to start the quarter, the Spurs knocked down three pointers on consecutive trips to make it 38-31 and draw a Grizzlies timeout. After trailing by 13 to start the quarter, this is good progress for the Silver & Black. After one, the Spurs trail 33-20. It didn't take long for the Spurs to establish a tone, forcing the Grizzlies to commit a ton of fouls. The Spurs took 8 free throws in the game's first 8 minutes, but the scoring in the regular offense was a bit slow to start. Rudy Gay, who missed Saturday's game, opened the scoring for the Spurs with an exclamation point. The Spurs haven't had an answer for Avery Bradley. The new Grizzlies guard, who started the season on the Clippers, made his first four shots. None of them were from three, though, and that's where Davis Bertans thrives. You hate to call a game in February a must-win, but you can't help but wonder if the Spurs are treating Tuesday night's game with that level of urgency. After losing the first four games of their annual Rodeo road trip, the Spurs got to stop in San Antonio after a brutal west-coast swing. The Silver & Black were on the wrong end of a 125-105 final Saturday afternoon in Utah. That came after road losses to the Kings, Warriors and Blazers last week. After Tuesday night's game, the Spurs will get plenty of rest, not playing again until Friday, February 22 in Toronto. The only Spurs player who will take part in any of the All-Star festivities this weekend in Charlotte is LaMarcus Aldridge, who will continue San Antonio's record streak of players selected to the All-Star Game. Tuesday night, the Grizzlies will be playing without Mike Conley. The team's star point guard is ill. Center Jonas Valanciunas, acquired in the major trade that sent Marc Gasol to the Raptors, is available. Out are wings Chandler Parsons and Kyle Anderson, a former Spur. Follow along with the KENS 5 team as the Spurs play their last game before the All-Star break. Tip-off is slated for 7 p.m. at the FedEx Forum in Memphis.